Kitchen is the focal room of your home and needs as much of décor planning as a living room or bedroom. As you spend a lot of time in the kitchen, it is imperative that the look and feel is soothing, relaxing and pleasing. Who would want to work in a dull, boring and shady kitchen? This is where you can come up with creative ideas to give a great look to your kitchen and that too in an inexpensive way. Kitchen cabinet ideas like painting, designing, refacing or refinishing are a great way to renovate your kitchen without having to go through a tedious task of replacing them with a new set of cabinets. This of course does not apply to kitchen cabinets that are in completely damaged state… they do need replacement. 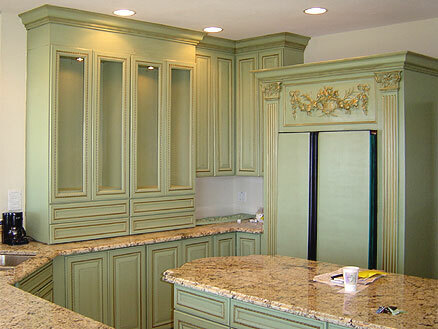 Light green antique kitchen cabinets in combination with natural stone countertops. Photo courtesy of Vicky Harleman, L.L.C. 1. Painting entire kitchen – you can either use a single light shade like white, off-white, cream, light yellow or go for contrast like white walls and dark chocolate brown for cabinets. Make sure the kitchen does not look too dark or it will rob the lighting scheme and make it look small too. An interesting variation for large kitchens would be to paint only the island cabinet in a contrast color, while keeping rest of the kitchen in a single shade. 2. Painting only cabinets – You can choose to paint the frame and cabinet sides in one color and doors in other or just paint the entire cabinet in one color. Again, you can add a touch of style by designing motifs on the door. You can also add an effect to the cabinets by wiping slightly dried paint with a sponge. Oil or latex colors can be selected as per your ease; but note that latex colors dry off easily and oil color takes a week. You can creatively color the cabinets according to your desired style like French, Italian etc. Once you have decided on what all you will paint, you need to decide on your kitchen color ideas. That is, whether you will use color combinations or single color. Colors can add a positive vibe to the kitchen. Shades of white are popular and give a clean look. Do remember that cabinet colors will always highlight your wall colors, so choose light shades for walls. A variety of color schemes are available according to kitchen styles or themes. Apart from color, it is the kitchen cabinet designs that will also be a striking feature of your kitchen. You could come up with new kitchen cabinet design ideas like incorporating Lazy Susans, pull-out shelves, under-the-cabinet racks, etc. to perk up their functionality as well as their inner style and look. Chrome shelves, spice racks etc. give a stylish edge to otherwise boring box like cabinets. You could consider replacing the cabinet front with tinted, painted or just crystal clear plain glass for that classy look. Even the cabinet accessories like knobs and handles can give a whole new appearance to your existing cabinets. For small kitchens, there is less work to do but certainly no dearth of ideas. If your kitchen is small, keep the walls in light shades. Cabinets should not be too dark or they will make it appear smaller. You can add effects like sponge, brush or feather wipe to the cabinets which can give them a rustic yet elegant appearance. Stylish handles or knobs can highlight your cabinets. For those inaccessible and difficult corner cabinets, corner kitchen cabinet ideas like sliding out units or Lazy Susans can be used to make them more accessible and functional. It can also be utilized to stack sparingly used appliances. Apart from painting and adding glam accessories, you can also consider kitchen cabinet refacing ideas like applying wood veneer, wallpaper, adding a frame (with your favorite snaps) to the cabinet door, magnetic paint (to stick colorful magnetic images on the outside), fabric frames, tinted glass etc. You could also try kitchen cabinet refinishing ideas like using stencil designs, carving, adding fancy stuff like small white curtains, wired mesh, faux painting techniques like sponge, rag or crinkle painting on the cabinet front or just color coordinating the accessories with some theme, like covering them with fabric to match the style of your kitchen or walls. Give your creativity a kick start by using a combination of above kitchen cabinet ideas to bring about a whole new look for your dream kitchen. Cloudy White Residue On Your Dishes? Really great kitchen cabinet painting tips. I love this post. Thanks for this helpful information. Good thing that I happen to stumble into this blog before my kitchen remodeling. This time I will try to paint my kitchen walls with a light single color in contrast with my dark wood kitchen cabinets. That’s good advice for me on the kitchen. I would love to use white for the kitchen. It may sound stupid, but a new ‘fashionable’ feature of some kitchens is to now have no upper cupboards (from above the work surface). This helps to open up the kitchen and gives it the feeling of being much bigger. This is only an option for you of course if you have more lower level storage. Thanks for sharing these great kitchen cabinet ideas! Love it!